Therefore, if anyone is in Christ, the new creation has come: The old has gone, the new is here (2 Corinthians 5:17). Most Christians see their conversion as a cleaned-up version of their old self, rather than as a brand new creation who did not exist before. The Bible says, “Therefore, if anyone is in Christ, the new creation has come: The old has gone, the new is here” (2 Corinthians 5:17). The old is gone, not just spiffied up. After high school I went to college where I met and married an awesome Christian man whom I met at a friend’s Bible study. I saw him sitting on the floor with his back against the wall and his red flannel shirt rolled up his masculine arms. He had a worn Bible in his lap and an easy smile on his face. Before the year was up, I became his wife. About four years later, I became a mom. When I was in my mid-thirties, I sat under the teaching of an older woman in my church, Mary Marshal Young. She opened my eyes to the truths in Scripture about who I was, what I had, and where I was (my position) as a child of God. I had read those verses scattered throughout Scripture before, but when she encouraged me to cluster them altogether into one list, God began a new work in my heart. Heavenly Father, thank You for choosing me! Help me to believe that I am who You say I am, even when I don’t feel like it. I am standing on the truth of Your Word with shaky legs, but I’m standing all the same. Think of one lie that you believe about yourself, and then write down the verse about how God sees you to replace that lie. 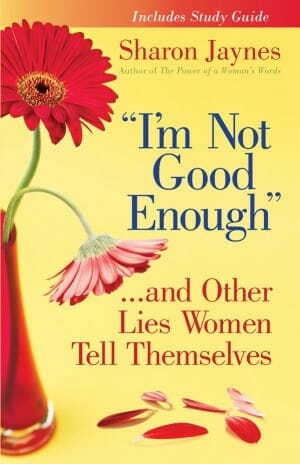 To learn more about how to recognize the lies, reject the lies, and replace the lies with truth, check out my book, I’m Not Good Enough and Other Lies Women Tell Themselves.It will transform your stinkin thinkin into confident joy! It also includes a Bible Study guide, which is perfect for group studies. And for a quick reference guide of Your True Identity in Christ, see my laminated card that fits snuggly in your Bible.